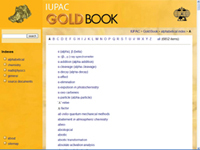 IUPAC announces the release of a new version of the online Gold Book <goldbook.iupac.org>. It contains more than 300 new terms, improved rendering of mathematical formulas, new and better server-side search, and improvements in both content and code. DOIs have been registered for all the terms in the Gold Book providing durable links that can be used in documents that reference terms in the Gold Book. In addition, and to allow for structure search, InChI and InChIkey have been added in the metadata of all chemical structures appearing in the Gold Book (International Chemical Identifier <www.iupac.org/inchi>). The Gold Book, more formally the IUPAC Compendium of Chemical Terminology, is a compendium of definitions recommended by IUPAC in many areas of the chemical sciences. The Gold Book contains only definitions approved by international consensus and thus can be regarded as truly authoritative. Please send any comments and suggestions regarding the functionality, usability, and content of the electronic version to Bedrich Kosata. Page last modified 7 November 2008.